Dec. 27 — Went over to 6th Gen Hosp in the afternoon. Our work is not heavy but is steady. At 10 p.m. — Joep, Get and I started for Ghent but had a car accident a few miles out of Turnhout, so Marion and Gordie returned to Zielst and Arnold, Joep and I did our shopping in Turnhout, and an ambulance came down and picked us up. Arrived home at 11 P.M.
Dec. 29 — Famous “Devils” party in our home tonight. The party was quite a success . Dec. 31 — New Years Eve Party at Baselman’s home. Much the same crowd present as at Xmas Eve. We drank the Old Year out and the New Year in with Champagne. Jan. 1, 1945 — At 9:30 A.M. a terrific German air attack on the Eindhoven Airport (Operation Bodenplatte). The windows in our buildings were broken and I believe 400 German planes took part in the attack. 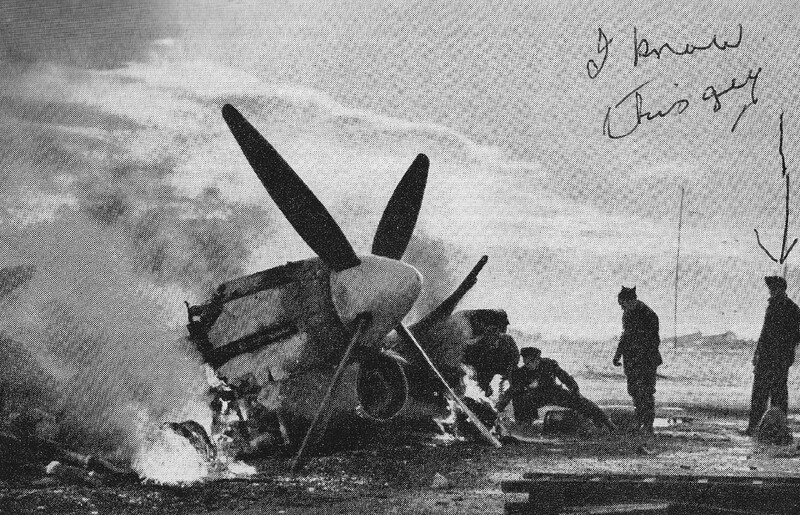 About 45 of our airplanes were destroyed on the ground and there were several killed and wounded. There was a great deal of excitement around. I have never seen so many aircraft in the skies at one time since Dieppe. On January 1, 1945, the German Luftwaffe launched Operation Bodenplatte – often referred to as the Hangover Raid – and destroyed over 50 aircraft at the Eindhoven airfield (B-78) where Corporal Weiss (the figure on the far right) was serving on the ground crew. Walter Weiss. The Memory Project.